Description: CR GG1 4861 leads 4807 eastbound with mixed freight on June 11, 1977. 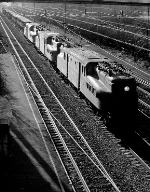 Description: Three GG-1's have AST-4 at track speed passing Colonia, NJ on the N.E.C. Description: GE GG1 No. 4802 is in the lead. Description: CR GG1 4802 at Wilmington, Delaware on an unknown day in May 1979, Kodachrome by Chuck Zeiler.